Some CDs are meant to be played straight through, with no fading between the songs. 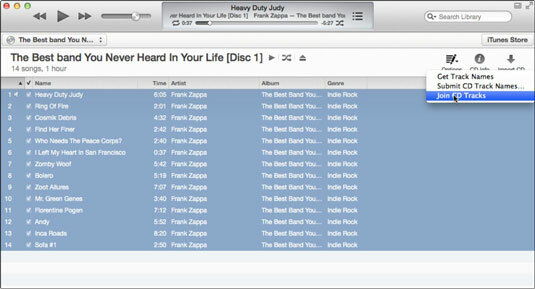 Fortunately, you can join tracks of a CD in iTunes so that the tracks play seamlessly one to the next. 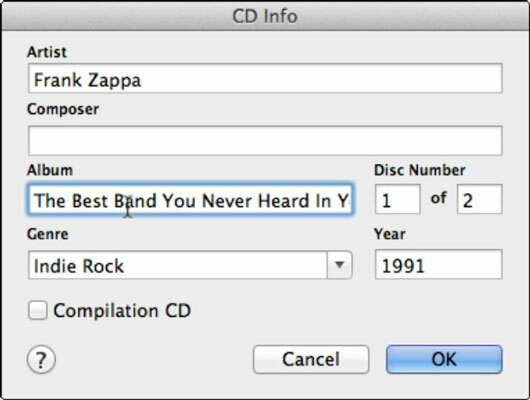 You can also edit the CD information — the artist name, composer, album name, disc number, year, and genre. To edit the CD information, click the CD Info button to the left of the Import CD icon. The CD Info dialog opens. Edit the information fields as you wish and click OK.
To join multiple tracks on the CD into one track, first select the songs that you want to play continuously (such as the first two songs of Sgt. Pepper or all the songs of a live CD). To select multiple songs, click the first one, press and hold Command on a Mac or Ctrl in Windows, and click each subsequent song. To select consecutive songs, click the first one, hold down the Shift key, and click the last one. After selecting the songs, click Options and choose Join CD Tracks. You can join tracks only before ripping a CD, not afterward.